Robert Blake Theodore ?Terrible Ted" Lindsay is a former professional ice hockey player, a forward for the Detroit Red Wings and Chicago Blackhawks of the National Hockey League. He scored over 800 points in his Hockey Hall of Fame career, won the Art Ross Trophy in 1950, and won the Stanley Cup four times. 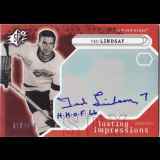 Often referred to as "Terrible Ted", Lindsay helped to organize the National Hockey League Players' Association in the late 1950s, an action which led to his trade to Chicago. New Response (Return To Sender): return to sender -- refused -- unable to ..